Oni(鬼) variously translated as demons, devils, ogres or trolls) are popular characters in Japanese art, literature and theater. Hairy, multi-colored humanoid creatures, dressed in tiger skin loincloths, Oni are frequently depicted with claws and horns. Often carrying iron clubs, Oni are considered to be invincible. 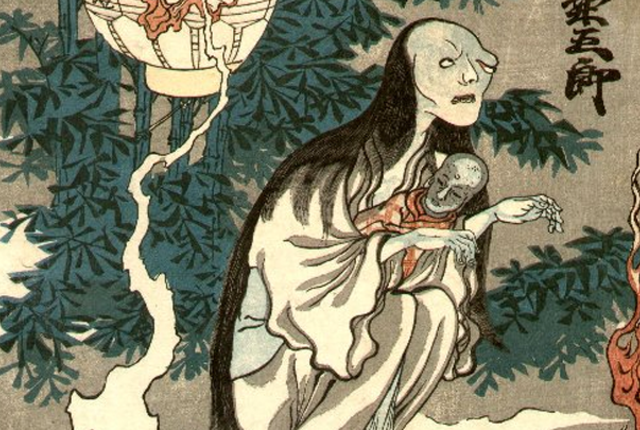 Yurei(幽霊) are creatures of Japanese folklore similar to ghosts. The name Yurei is often translated as faint spirits or departed souls. During the Pacific war, Japanese often referred to the Allies as 鬼畜 (kichiku, “demon-creature”), originally a Buddhist term meaning “brute” or “beast,” expanded to 鬼畜米英 (kichiku Beiei, bestial Americans and British) or 鬼畜米帝 (kichiku Beitei, bestial American imperialists).